This 3 AA flashlight is cETLus, ATEX, IECEx, INMETRO and MSHA listed Intrinsically Safe Permissible. 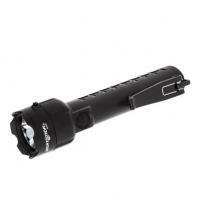 It uses a CREE LED rated at 140 lumens that works in conjunction with a high-efficiency deep parabolic reflector to create a usable flashlight beam rated at 180 meters. The single body switch provides momentary or constant-on functionality. Power comes from 3 AA batteries (not included).